Portadown will attempt to shake off Saturday’s Irish Cup final disappointment over the next few weeks and put in place a summer plan designed to get the club back on track. 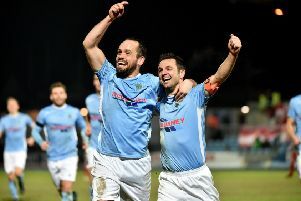 A 1-0 defeat to Glentoran left the Ports without silverware and the financial boost of European qualification following a campaign that provided so much promise across league and cup but, ultimately, finished with regret rather than reward. Assistant manager Kieran Harding accepts the summer blueprint has been altered by last weekend’s cup setback but insists there is a foundation on which to regroup and rebuild. “With a few big months coming up, our obvious intention is to keep what we have at the club,” said Harding. “Most remain under contract so now it is a case of sitting down with the Board of Directors and working out the way forward. “We have a good squad and some really promising up-and-coming players. “The European bonus would have perhaps given us other options but we have always operated with a small squad. “There remains a real sense of belief and a mix of experience and youth. “The downside is how the season fell away and we must analyse those areas. “Injuries and suspensions did not help and we accept the number of bookings is something we have to address. Increased strength-in-depth could help achieve consistency and Harding confirms a recruitment plan remains in place. One key element of the summer programme could be the Setanta Sports Cup - although the decision to postpone the draw this week suggests the competition’s future remains at risk. The knockout format has quarter-finals marked from June 20-25 - with Glenavon, Glentoran, Crusaders, Dundalk, Shamrock Rovers, St Pat’s Athletic and Cork City the other proposed teams.